On Fri, June 16, San Francisco’s Department of Homelessness and Supportive Housing released the 2017 San Francisco Point-in-Time (“PIT”) Count report. On one night in January, volunteers canvassed the City to count the number of people experiencing homelessness. The PIT Count attempts to capture anyone who is visibly homeless in San Francisco, both in shelters and on the streets. 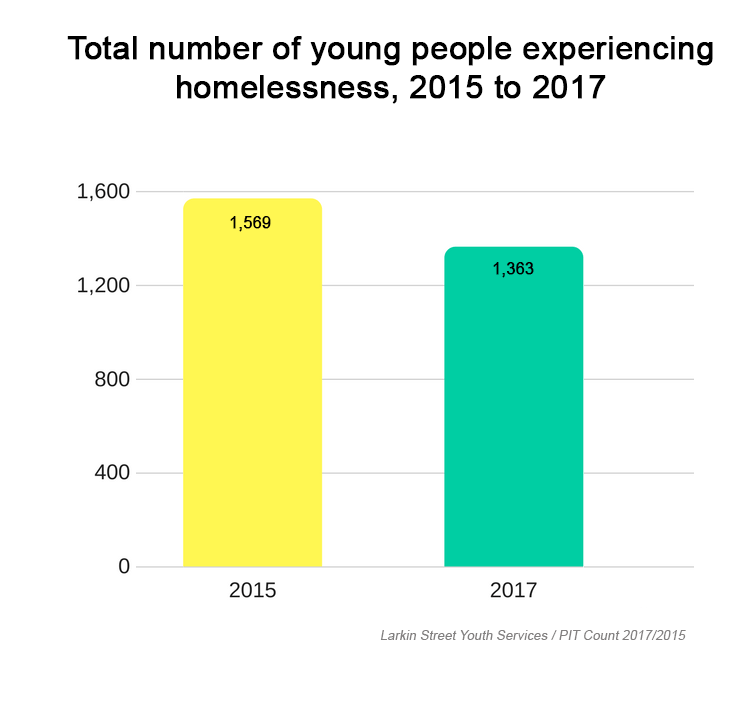 Because young people experiencing homelessness often avoid the streets, the PIT Count isn’t optimized to perfectly capture the full scope of youth homelessness. To better count young people, San Francisco introduced a youth-specific component in 2013. The Youth Count taps the invisible population of homeless youth with innovative strategies like recruiting current and formerly homeless youth to identify and count their peers. 1. Young people account for about one in every five people experiencing homelessness locally. This was true in 2015, and it remains true in 2017. The PIT Count shows that 1,363 out of 7,499 people experiencing homelessness in San Francisco are unaccompanied young people ages 24 and under. 2. Youth homelessness decreased by about 13% between 2015 and 2017. In 2015, the PIT Count and supplemental Youth Count captured a combined total of 1,569 homeless young people ages 24 and under. In 2017, the combined total decreased to 1,363. 3. This decrease in youth homelessness occurred during a time of increased investment by the City. The PIT Count provides more “what” than “why,” but one factor is clear: The City increased funding for homeless youth by 15% between 2013 and 2017, contributing to the 13% decrease in 2017. 4. There are more youth experiencing homelessness than were counted. The PIT Count is a snapshot of homelessness on a single night in January, but doesn’t capture people who cycle in and out of homelessness during the rest of the year. Approximately 2,500 young people access Larkin Street’s services over the course of a year – 83% more youth than the PIT Count captures. The 13% decrease in youth homelessness shows what the City and nonprofit partners can do with targeted, youth specific investments. If we can reduce youth homelessness by 13% with a 15% funding increase, just imagine what a larger investment could accomplish. There were 1,363 youth living, literally, on the streets of our city on a cold night last January, as well as their uncounted brothers and sisters. They are also our brothers and sisters. We cannot rest until they have a safe place to rest at night, and nourishing food, an education and self-sustaining work. Please join in this critical effort. It will take all of us to end youth homelessness. Our youth are counting on your support.